A ‘flexible’ pinned – pinned beam with a pivot at one end and a roller pivot at the other – the beam itself provides the elasticity A rigid and heavy steel frame holds the systems. The frame has a low natural frequency, so the vibrations of the systems do not affect it. The frame has two sections: an experiment ‘window’ to the right and a control panel to the left. The experiment window contains the beam, spring and other parts used in the experiments. TecQuipment carefully designed the equipment so that all experiments use the same beam. This gives a simple and quick system set up and changeover time. The beam is of high-grade ground steel, and the pivots use high-quality ball races for lowest friction and incidental damping. Students may vibrate the systems manually. They may also force the vibrations using a high-quality variable speed servomotor driving a rotating offset mass – forming an ‘exciter’. The servomotor has its own encoder and advanced controller for accurate speed regulation. This gives minimal cyclical variation due to inertial load variations. A non-contacting sensor measures beam displacement. The sensor has no physical contact with the oscillating system, for negligible damping. An accelerometer built into the exciter assembly works to show the phase relationship between beam displacement and acceleration. It also helps to compare measured acceleration with that derived from the displacement using the software. The unit includes a variable-area viscous dashpot damper, for use with a non-toxic fluid (supplied) of stable viscosity. 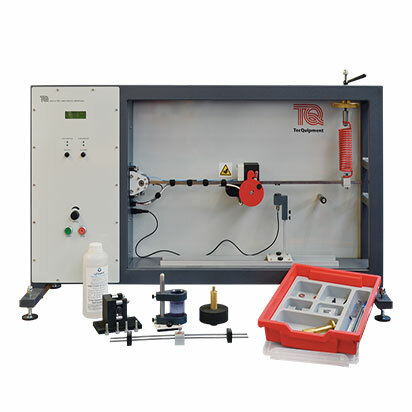 This ensures repeatable results over a range of ambient temperatures. An encoder linked to the rotating exciter mass measures its dynamic position. This helps to measure the relationship between the applied force and the position of the beam, showing phase lag with different damping values. TecQuipment include a vibration absorber with the equipment. When fixed to the beam it adds a second degree of freedom to the complete system. This demonstrates the typical behaviour of a 2 degree of freedom (2DOF) system. Students learn how to ‘tune’ the vibration absorber to eliminate the oscillations of the main beam – a special case of a 2DOF system and an alternative method to damping. To help store small parts and tools, TecQuipment supply a storage tray with the equipment. The control panel houses the servomotor controller and manual controls, alongside a digital display of the motor speed in units of rev.min–1, rad.s–1 and frequency in Hz. It also provides outputs of the displacement, acceleration, encoder (offset mass) position, and motor speed. These outputs are calibrated and scaled to work directly with TecQuipment’s VDAS® (mkII) system. 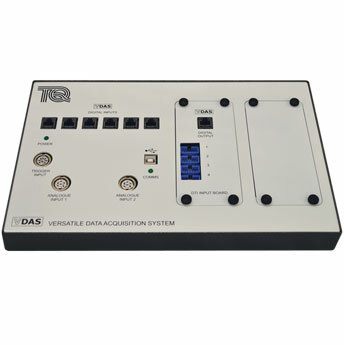 The output signals connect to the VDAS® interface which converts them for connection to a suitable PC (not supplied). The VDAS® (mkII) software includes functions to display live plots of first and second derivatives, to show velocity and acceleration wave-forms based on the displacement signal. Advanced features of the software allow signal smoothing, reference plots and a tool to help measure the free vibration damping coefficient. TecQuipment have specifically designed the TM1016 to work with VDAS®. However, the sensor and trigger outputs may be connected to your own data acquisition system or oscilloscope if desired.